Paul Theroux has a brilliant piece in the Times travel section today. Why We Travel. And, as usual, travel addict Theroux gets it right. It is about knowing and feeling the places of the world as they are in good times and bad. He talks about being in Northern Ireland when it was dangerous and Sri Lanka, the Philippines and Columbia when they were on the ‘dangerous places to travel’ list and found all to be interesting and generally pleasant places to visit. I have not been in dangerous situations but I have been in places considered dangerous. People say “should you go there now?” Like Theroux I do not imagine myself in Somalia at this moment in time…or Afghanistan…or Libya, but I do see myself in pretty much any other place on the globe whatever the exceptional or deplorable qualities of the food, hotels, transportation and weather, even walking in some of those holiday parades and political marches that are usually accompanied by a good deal of optimism or tension. My travels have taken me to various African dictatorships but only once have armed soldiers aimed their guns at the vehicle in which I was traveling. And that was only because the African driver did not come to a full stop at the entrance to Mobutu’s personal theme park back in the days before Zaire became the Democratic Republic of the Congo and the new crooks and abusers came to power. I followed the first political get-out-the-vote marches around Budapest, a rare gay rights march in Madrid and a protest rejecting Chinese takeover in Hong Kong. They were peaceful, celebratory actions and far more interesting than the local cuisine or most museums. Crossing the border to go into—not being in—the West Bank and Jerusalem and Tel Aviv was scary—not in terms of personal safety but rather fear for the future of a place where the hostility is so thick it can be cut with a knife—or shot through with a bullet! This weekend I am thinking about Cote d’Ivoire where I spent a couple of fine weeks in 1999 and 2001. Abidjan was a big messy interesting vibrant city with troubles already looming (one coup and one attempted coup took place during this time) but not obvious to all of the African, European and American performing arts presenters there for MASA (Marché des Arts du Spectacle Africain). We walked around town, ate at the neighborhood pizza joint and bussed out to a village only slightly tarted up for tourists. All in all an ordinary visit to a new (for me) country. Now the war of Gbagbo versus Ouattara commences and Ivoirians will shoot and be shot at, go hungry, stop studying, get ever more used to the sound of bullets in the night. What I am saying is this: I travel because I want to ‘get it.’ The world brought to you live, not screened for your viewing pleasure. Abidjan is a real place full of regular people who eat pizza and don’t really want to die. It is my birthday today. My gifts to me are the time and new maps necessary to figure out how to get to the125 countries I must still reach before I die. Because then when I am old old the very mention of a place, any place, will bring back a smell, a taste, a song, a friend, a sight, sound. And I will know what they are talking about. Because. Well read the article! My sons gave me a new TV, my FB friends are brightening my day with many ‘happy birthdays’ but Paul Theroux gave me the best present of all…putting into writerly words the things I know about why I travel. 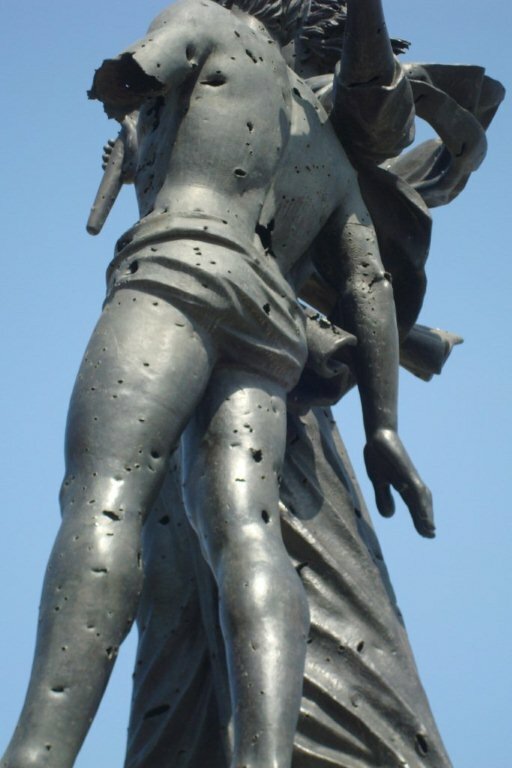 In Beirut some years ago feuding gangs murdered the sculpture of dead heroes. In a couple of weeks I will travel to Beirut again to see dancers dance their dances made for the Middle East and North Africa as it is NOW!